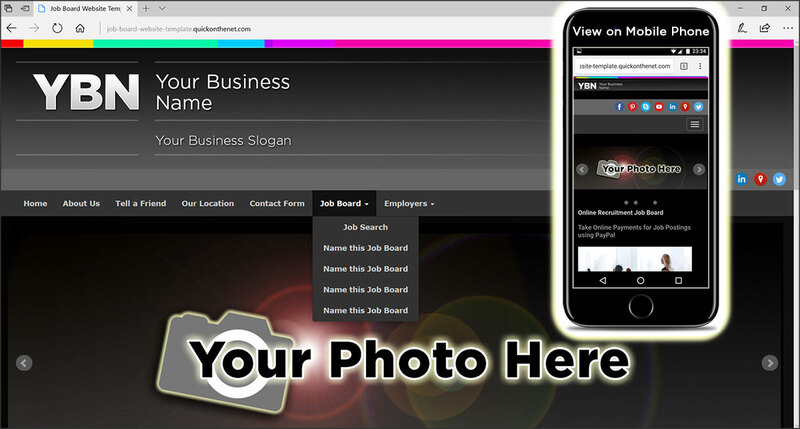 This template will allow employers to submit jobs to you via email, using an online contact form. You have the option of charging the employer and taking an online payment for posting a job, using PayPal or another payment provider. It is important to note that only YOU, as the job board website owner, can directly add jobs to the site. This puts you in complete editorial control of your website. All of our job sites contain a search facility. This intelligent feature searches through your entire website and extracts all web pages containing the 'search string', including the job description web pages. Easy! As standard, each website is supplied with 4 job boards (or 4 Galleries). Each gallery can contain many different jobs e.g. you could have 30 individual click-through jobs per gallery. As a guide, a standard website is good for around 100 jobs. If you upgrade and buy 'Extra Galleries', then you will have a grand total of 20 Galleries. As a guide, a website with 'Extra Galleries' is good for a whopping 1,000 jobs.